Custom designed for your precious Fitbit Charge 2 Heart Rate + Fitness Wristband, this MoKo Fitbit Watch Band Cover features a combination of functionality and style. * Personalized Your Fitbit Charge 2 Smartwatch Heart Rate Fitness Wristband with this stylish bright color silicone band cover. * Keep your Fitbit charge 2 HR in good condition for a longer time. NO tracker or band, band cover ONLY! * 10 PCS included, 9 colours including Black(2pcs), White, Red, Mint Green, Barbie Pink, Indigo, Ornge, Purple and Walnut for your to match your daily style. * Completely access to all ports and features, fully washable. 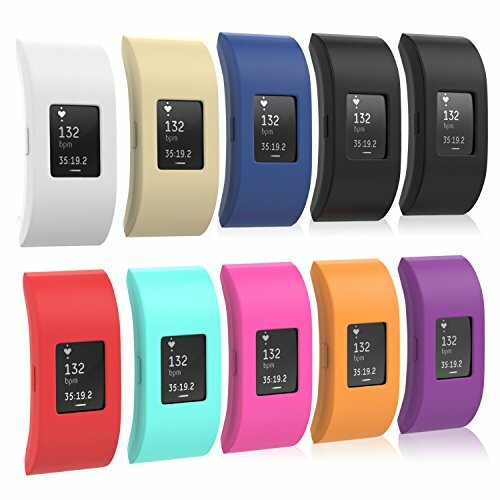 Personalized Your Fitbit Charge 2 Smartwatch Heart Rate Fitness Wristband with this stylish bright color silicone band cover. Keep your Fitbit charge 2 HR in good condition for a longer time. NO tracker or band, band cover ONLY! 10 PCS included, 9 colours including Black(2pcs), White, Red, Mint Green, Barbie Pink, Indigo, Ornge, Purple and Walnut for your to match your daily style. Completely access to all ports and features, fully washable.